Edmonton Oilers' general manager Peter Chiarelli made his mind up to fire coach Todd McLellan after Sunday's loss to the Las Vegas Knights. Edmonton Oilers general manager Peter Chiarelli says he made up his mind to fire coach Todd McLellan after Sunday's loss to the Las Vegas Knights. McLellan was relieved of his duties Tuesday morning and replaced by Ken Hitchcock. "It really came up after the Sunday game," Chiarelli told reporters Tuesday at a news conference in San Jose, Calif. "[I] barely slept on it and started thinking about it in the morning. "What I saw were levels of flatness, and levels of non-response, and when that happens the radar goes up and we decided to act." Chiarelli said he felt he had to act before the Oilers, who play the Sharks Tuesday night in San Jose, fell too far back in the standings. "With all the parity in the league, I think the timing was right now to do it. There's still a lot of runway left in this year and we felt a new voice would be helpful." Chiarelli told reporters McLellan was "obviously disappointed." "He's a good man. We've all been fired before. He'll be back in the league in short order." Chiarelli refused to blame McLellan solely for the team's slide in the standings after losing six of the last seven games. "This isn't just an indictment of Todd or the players. This is a collective thing, and it's our job to get to the playoffs, and we owe it to our fans. And I felt this was the right move for it." When Hitchcock spoke with the players before their morning skate in San Jose, his message was straightforward and to the point. "I want to be able to tell them everything I'm about, both good and bad. I want them to be 100 per cent prepared for what they can expect from me so that we don't have to go through the dance and we started that today." Oilers captain Connor McDavid said the players were disappointed over McLellan's firing. "Todd is a guy that everyone liked," he said after practice in San Jose. "Ultimately, we're a team that's underachieving right now, and no one likes where we're at. So the change is necessary. "This isn't on Todd at all. It's on us as players. We've got to wake up here." <a href="https://twitter.com/hashtag/Oilers?src=hash&amp;ref_src=twsrc%5Etfw">#Oilers</a> President of Hockey Operations &amp; General Manager Peter Chiarelli will address the media from San Jose at 11am MT. We'll be streaming live here on Twitter as well as Facebook, YouTube, <a href="https://t.co/rKXr7PLP2B">https://t.co/rKXr7PLP2B</a> &amp; our app. Chiarelli said he worked with Hitchcock at the Sochi Olympics in 2014 and called his track record impeccable. "He knows how to inject system structure [and] execution in a short period of time." Hitchcock, 66, is well-respected and a task master, he said. 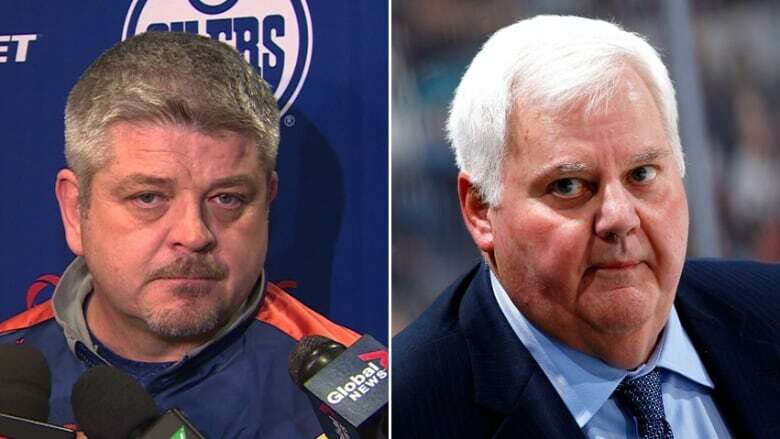 Originally from the Edmonton area, Hitchcock came out of retirement to take the new job. "He's very excited and motivated." Chiarelli said Hitchcock will coach the Oilers to the end of the season, when the coaching staff will be re-evaluated. McLellan, 51, coached the San Jose Sharks for seven seasons before coming to Edmonton in 2015. Hitchcock is the third winningest coach in NHL history with a total of 823 victories and a .603 winning percentage. In his 22-year coaching career, he made 14 appearances in the Stanley Cup playoffs. He guided the Dallas Stars to the franchise's first Stanley Cup title in 1999 before coaching in Philadelphia (2002-06), Columbus (2006-10) and St. Louis (2011-17). He was awarded the Jack Adams Award as the NHL's top coach in 2011-12.